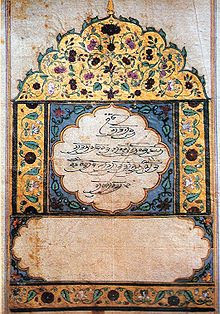 is the religious text of Sikhism.It is a voluminous text of 1430 angs, compiled and composed during the period of Sikh gurus, from 1469 to 1708. It is a collection of hymns (shabda) or baani describing the qualities of God and why one should meditate on God's name. Guru Gobind Singh (1666–1708), the tenth guru, affirmed the sacred text Adi Granth as his successor, elevating it to Guru Granth Sahib. The text remains the holy scripture of the Sikhs, regarded as the teachings of the Ten Gurus. The role of Adi Granth, as a source or guide of prayer, is pivotal in worship in Sikhism.